While there’s no doubt that white sneakers are a wardrobe staple given the fact they go with virtually everything, they’re also quite ubiquitous so it’s only understandable to want something different to mix up your look from time to time. Lucky for you there are now a plethora of sneaker options available in a rainbow of colours and striking patterns. Pink! Blue! Leopard! It’s all here for your comfortable footwear pleasure. One of the best (and comfiest!) trends to come out of late is that of sneakers being elevated from something you’d wear on a full day running errands to bonafide fashion staple. Classic styles such as Adidas’ Stan Smith and Converse’s Chuck Taylors have all become street style staples with high end designers now joining in the fun. Everyone from Saint Laurent to Jil Sander have now released their own versions of the humble sneaker and it’s a breath of fresh air after seasons of tottering around in impossibly high heels. The great thing about sneakers is that they’re so versatile —you can equally dress it up or down with bold jewellery or a chic, streamlined bag (as above) or opt for a plain colour or splash out on a fun print. In case you haven’t yet jumped aboard this trend here are some cheap steals and designer splurges to consider. White sneakers are without a doubt having a moment and there’s no shortage of options to choose from. Whether you want a slightly tougher edge like these options by Adidas, Converse or Le coq sportif or something a bit daintier and more feminine such as this pair by Fred Perry or this pair by Superga, sneakers in a neutral hue are guaranteed to get a solid workout in your wardrobe. 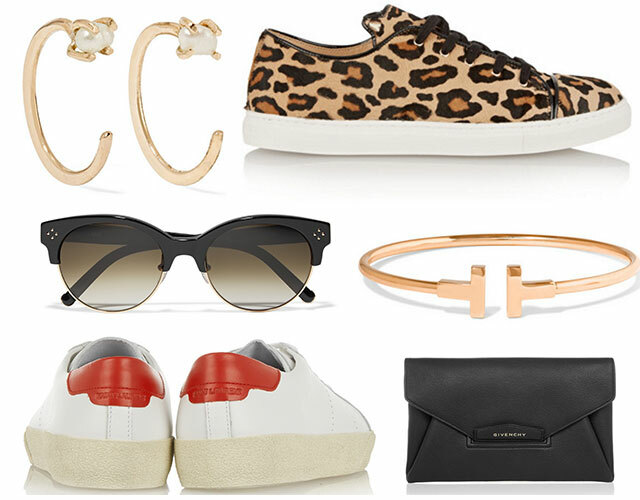 If you’re in the market for a splurge there’s no shortage of great designer sneaker options. Make a statement with a pair of animal print trainers such as this pair by Charlotte Olympia or one in a sweet pastel shade like this pair from Saint Laurent. 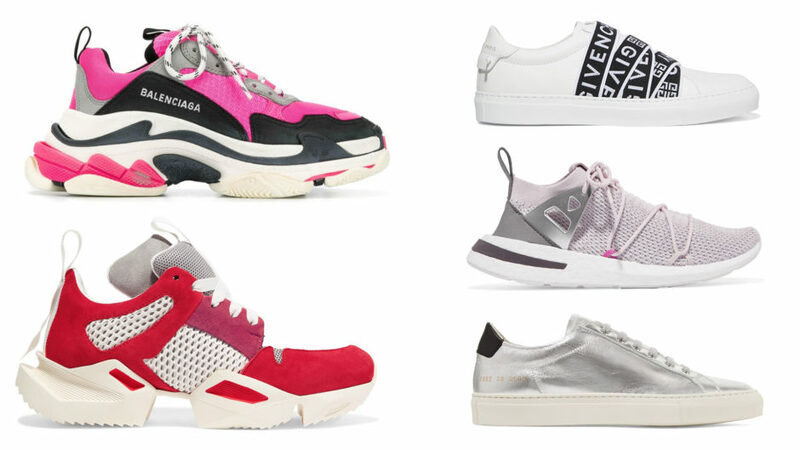 If you’re after a more classic pair try these sneakers by Jil Sander or Michael Kors or if you want something slightly more unique a textured pair a la these Helmut Lang sneakers is one way to get noticed. If there’s one thing I’m loving at the moment it’s the fact sneakers have evolved from footwear for the gym to bonafide fashion staple. High end designers have given the trend their stamp of approval with labels such as Chanel and Valentino releasing their very own interpretation of this most practical of footwear. Here’s how to nail the trend. Yes, there is such a thing as a casual sneaker and a dressy sneaker. I find the classic white leather Adidas Superstars or Stan Smiths are a little smarter and can work with dresses, playsuits and skirts for a more polished look while a sports shoe such as a black pair of Nikes work well with denim pieces such as shorts and jeans. You could opt for something slightly more classic and go for a canvas sneaker such as those by Superga which would work with a sweet sundress or a classic pair of denim shorts and a white tee a la Alexa Chung. If you’re going with white sneakers be sure to keep them clean so they don’t look like you’ve just pulled them out of your gym bag! Having pristine, crisp white sneakers is all part of the polished effect. If you opt for leather sneakers they can easily be wiped down and the laces can be put in the washing machine. If you’re planning to wear your sneakers with pants make sure they’re fitted (skinny jeans are perfect) and cropped so you can see a flash of ankle. This is more flattering when you’re wearing a chunkier shoe as it draws the eye to the narrowest part of your leg. Sneakers have quite a utilitarian look so it’s good to soften the look by teaming them with more feminine garments. Think pieces like a black slip dress or an A-line skirt. It’s all about maintaining balance with your outfit. If a pair of sneakers looks like something you could run a marathon in then they’re probably best left for doing just that! Casual sneakers should be quite simple (think neutral colours like white or black) and looks more sleek and streamlined as opposed to the kind of style you would have worn to PE back in the day.